Have we just taken a huge step towards discovering life elsewhere in the universe? The planet Earth is currently the only place in the entire universe that we know of which can support life. Earth is orbiting a rather unremarkable star in a rather unremarkable part of the Milky Way galaxy. The fact of the matter is that our sun is just one of about one hundred thousand million stars in the Milky Way alone. And the Milky Way, well it's just one of at least one hundred billion galaxies in the universe. Or to put it another way, there are more stars in our universe than there are grains of sand on Earth. But yet, as of now, Earth is the only place in the universe that we know there is life. 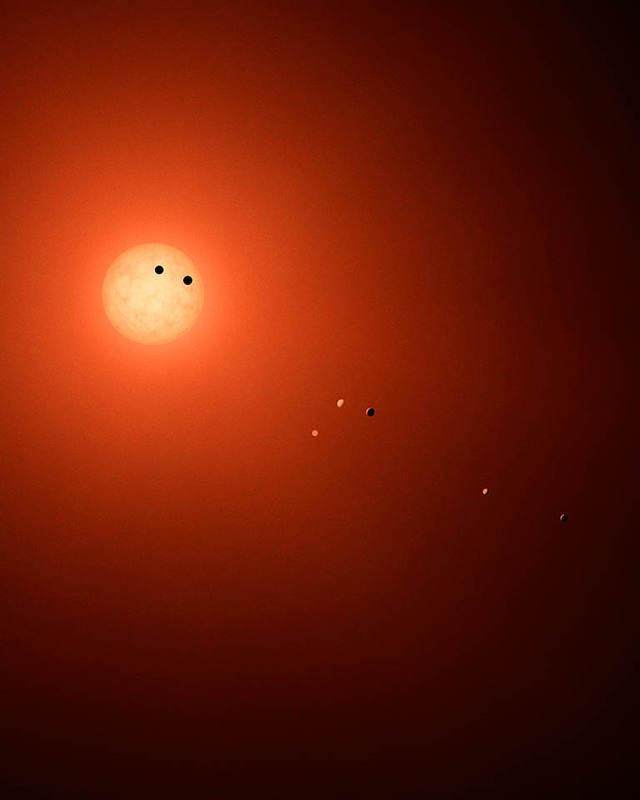 The planets of TRAPPIST- 1 Orbiting their star. The other requirements for life seem to be an atmosphere with carbon dioxide present. Our current atmosphere has about 0.04% CO₂, but the Earth's early atmosphere was much richer in the gas. This is vital for plants (or in the case of the early Earth, probably bacteria) to photosynthesize - to turn basic raw materials of water and carbon dioxide into glucose and oxygen, which can be used for respiration to provide energy for living things. This process does need light too, but pretty much any planet in the Goldilocks zone will have an abundance of that. The only other things that life really needs is the presence of organic molecules such as amino acids. These have been detected elsewhere in the solar system and are thought to be fairly common. (It's worth noting that the presence of organic material does not mean that there is life). Yet, despite all of this, we are yet to find life elsewhere in the universe. The questions that scientists have been asking for almost as long as we have looked up into the skies is always the same: Are we alone? And it's just not a question we are quite capable of answering yet. Before we can really consider if there is life, we need to find exoplanets (planets orbiting a star other than our own) which has all the conditions to support life. When you consider the sheer number of planets that there are in the universe, it seems incredibly unlikely that the Earth is unique. The process of finding other planets is not an easy one, and we are still refining the process and slowly discovering new planets. Well, today, NASA have made an announcement that may signal the end of the search for life elsewhere in the universe! A star that is located a mere 40 light years from Earth (a cosmic skip and a jump as the Milky Way is over 100,000 light years across) has been found to have not one, but seven planets orbiting it within its Goldilocks zone. All of these planets in theory could support liquid water, and three of these planets are in a position that is "just right" to support life. What this also tells us is that if a star so close to us has this many potentially habitable planets then there must be an abundance elsewhere in the universe. 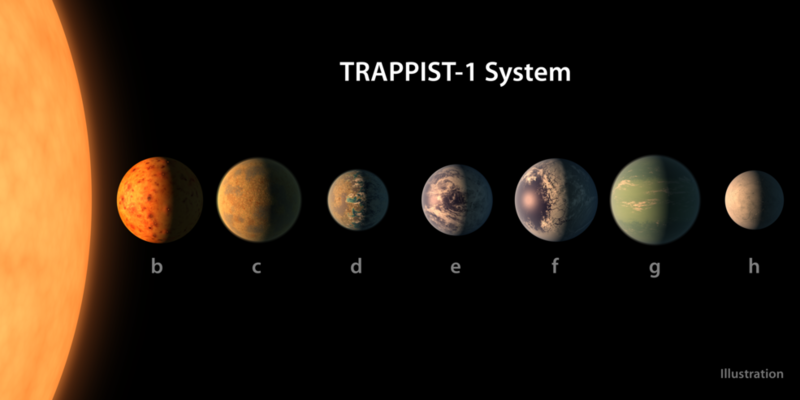 The TRAPPIST - 1 System. Is there life here? Of course, we cannot just jump to conclusions and assume that just because these planets are in a potentially habitable zone that they do contain life, merely that they have the prospect of supporting life. The next step that scientists will have to make is to study the atmospheres of these planets. This can be done with telescopes. We can look at the "spectra" of the light given off. This can tell us if the atmosphere contains organic molecules - a good sign that life might be be supported. Even better would be the discovery of water vapour, which would almost certainly indicate liquid water on the surface. Better still would be the presence of carbon dioxide, as we would know that would mean conditions that support photosynthesis. But best of all would be the discovery of oxygen, which would almost certainly tell us that there is life on these planets. There is, of course, a huge caveat to all this - that any life we were to discover elsewhere in the universe even remotely resembles the life we have on Earth. There is the possibility that completely different modes of life may have evolved elsewhere in the universe that share very little in common with what we recognise as life. One thing, however, is for certain: Discovery of life or not, we are living in very exciting times! Want to learn more about science? Have a child who you want to excel in science? Click here for more information and updates about our great online science courses that can help you to understand the world of science. By signing up you will also get a FREE e-book about seven scientists who changed the world and you will receive exclusive offers and discounts for our courses.